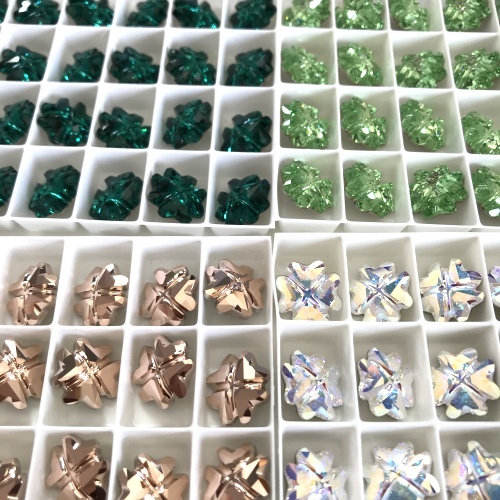 I'm always on the look-out for new or unusual beads, crystals & components I can use in my work as they can be a great challenge to design with and often it means I can bring you unusual projects using materials it might not be financially viable, or physically possible, for bead shops to stock. Sometimes I buy the materials with no idea what I'm going to do with it but others I know instantly what I want to make. Of course it doesn't always work... or it can take a lot longer to figure out than I originally envisioned, but eventually I get there. Recent examples of this are my Cate bracelet and Heart of Glass kits both of which I knew instantly what I wanted to make, and my new series of work which will be launching as a kit for sale at the Great British Bead Show in May and then soon after on my website. The new pieces (all part of a new series of work called 'Hugs & Kisses') all use some stunning Swarovski crystals I came across and knew straight away how I would 'bezel' them... but then I discovered they came in different sizes and couldn't resist mixing them... so out came the scissors and it was time for chopping my work up and returning to the bead mat for some extra experimentation. Thankfully my original idea worked and the series was able to expand into 2 different necklaces as well as various pendants and earrings, all of which will be able to be created with the kits and instructions so do sign-up to my newsletter to be the first to know when the kit launches.